All of Us :: Show Information :: RabbitTV GO! 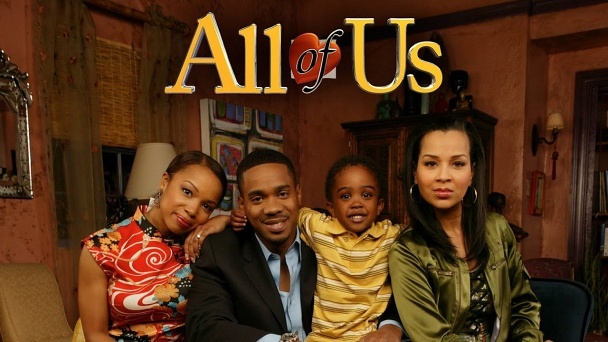 The series, which was loosely based on creator and executive producers Jada Pinkett Smith and Will Smith's own blended family, revolved around Robert James (Duane Martin) a divorced TV entertainment reporter with a young son, Robert "Bobby" James, Jr. (Khamani Griffin), and his fiancée, Tia Jewel (Elise Neal), a kindergarten teacher who helped him through the breakup of his first marriage. Robert shares custody of his son with his ex-wife Neesee (LisaRaye McCoy), with whom he shares a tenuously friendly relationship for the sake of their son. Robert also finds himself in a difficult situation, attempting to maintain the peace, however uneasy, between his ex-wife and his fiancée. Friends of the couple included Dirk Black (Tony Rock), Robert's single best friend and producer, and Tia's best friend and fellow teacher Jonelle Abrahams (Terri J. Vaughn). In season three, Tia breaks off her engagement to Robert, leaving a newly single Robert faced with a situation wherein Neesee must move in with him and Bobby temporarily after her apartment building is destroyed by fire. In addition to Tia, two other supporting characters, Jonelle and Turtle (James Vincent), were written out of the series. In season four, Laivan Greene joined the cast as Courtney, Dirk's long-lost daughter.